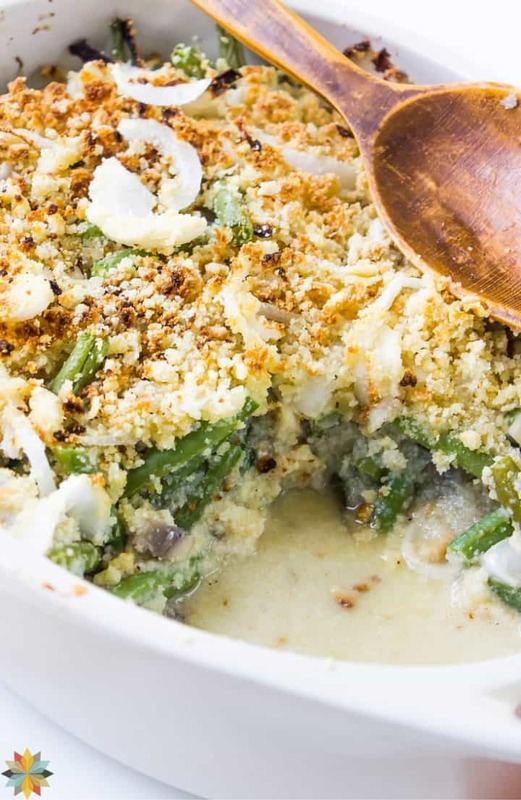 This Healthy Green Bean Casserole is a clean eating version of traditional Holiday fare. It's not only gluten free, but works for many different special diets, and it's super tasty too! Today I'm so thrilled to bring you a recipe for one of my FAVORITE Holiday recipes–healthy green bean casserole. One of my FAVORITE Holiday foods is green bean casserole. I mean, I love the turkey (well, I really don't love it unless there are other fixins with it) and sweet potatoes (not the casserole, but plain), and cranberry sauce–and of COURSE pumpkin pie….but really, I just LOVE green bean casserole. I remember being sooo excited when I was a young girl going for Thanksgiving or Christmas to my great-aunt's house. She ALWAYS had green bean casserole there and for some reason it always made the meal for me. Something about the creamy sauce and the crunchy munchy topping. I'm sure there are some of you out there who don't like Green Bean Casserole, whether it's healthy or not (in fact, my husband is one of those people–he's not into anything creamy. I think it's a “thing” from his childhood. He associated creamy things with being unhealthy and now even if I healthify them, he doesn't like them. Hmmmm…. ), but if you don't like Green Bean Casserole, then most likely you aren't looking on the internet for a Healthy Green Bean Casserole, right? So you aren't reading this. Back to those of us who “get” it about the crunchy munchy creaminess. 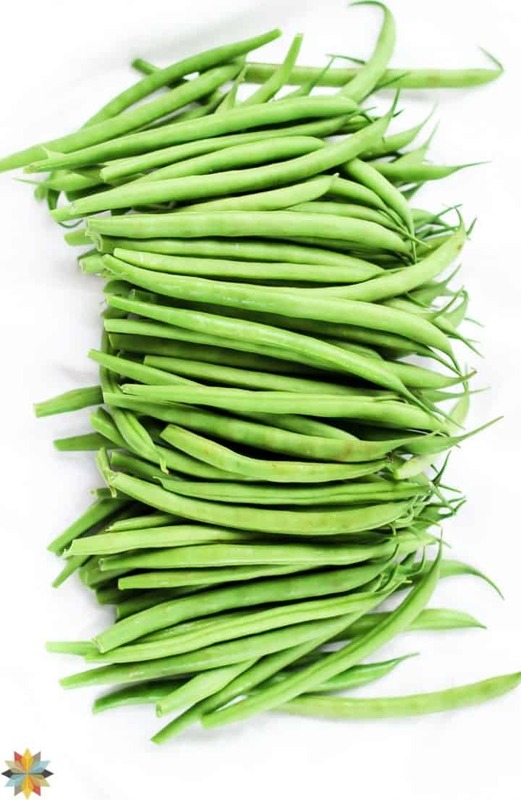 Anyhow, the recipe that I have today is a seriously good recipe for a paleo green bean casserole, and it's loaded with all kinds of healthy ingredients. Note–this is not your typical so called “healthy recipe” that is low carb, or low fat. This healthy green bean casserole really is that. It can easily be a Vegan Green Bean Casserole. So if you need to avoid dairy and eggs, this totally fits the bill. It can also be a Paleo Green Bean Casserole. 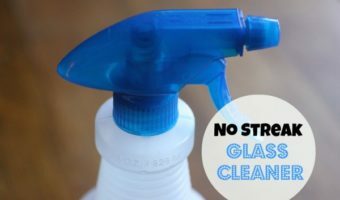 If you're avoiding grains and such, it works for you. It's a Gluten-free Green Bean Casserole. So all of you gluten-free folk can enjoy it too! 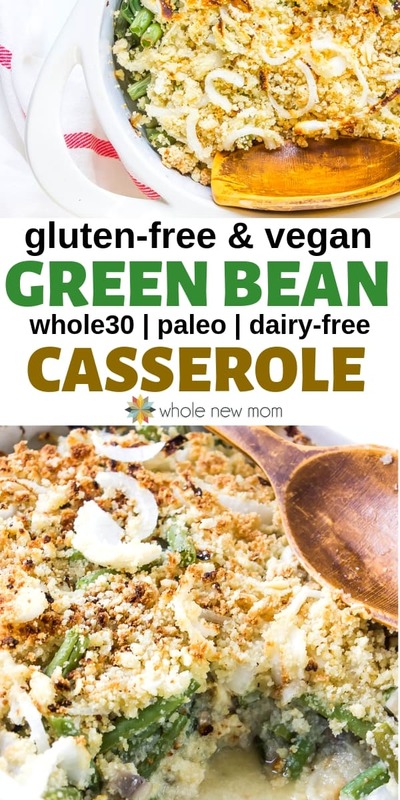 As you'll see below, this recipe for Vegan Green Bean Casserole comes from a fabulous Healthy Holiday Recipes Cookbook that is meant for people who are following the Paleo, Primal, or GAPS diet, so it will work for SOOO many people. And even if you are nut free, I'm pretty sure you could substitute sunflower seeds for the topping. 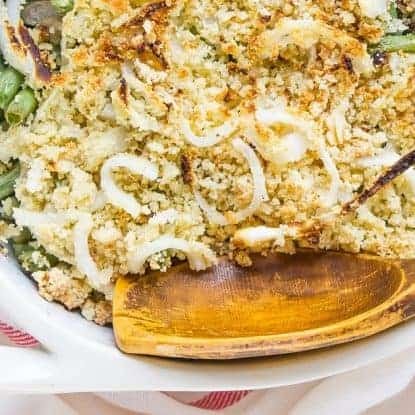 This gluten-free green bean casserole is loaded with SO many healthy ingredients that you can feel great serving it to your family and guests, knowing they will be truly nourished by it. Not typical casserole stuff that sits in your stomach and makes you wonder after the fact why you ate it in the first place. Nope – this is good stuff. The 2 biggest “healthy eating” offenders in a typical green bean casserole recipe are–the cream of mushroom soup and the french fried onions. So let's check out the totally not-so-healthy ingredients in those babies, shall we? Onions, Palm Oil, Enriched Flour (Wheat Flour, Niacin, Reduced Iron, Thiamin Mononitrate, Riboflavin, Folic Acid), Soy Flour, Salt and Dextrose. I was pretty shocked to see that ingredient list–at least ONIONS is the first ingredient there! These aren't as bad as I thought but I'm a flat out “no” on the soy flour since it's likely GMO, and for anyone with a gluten issue, these just aren't going to work. And the folic acid can potentially be a trouble for those with MTHFR issues (though granted, there isn't much in here). Ain't none of that stuff in this Vegan Green Bean Casserole! 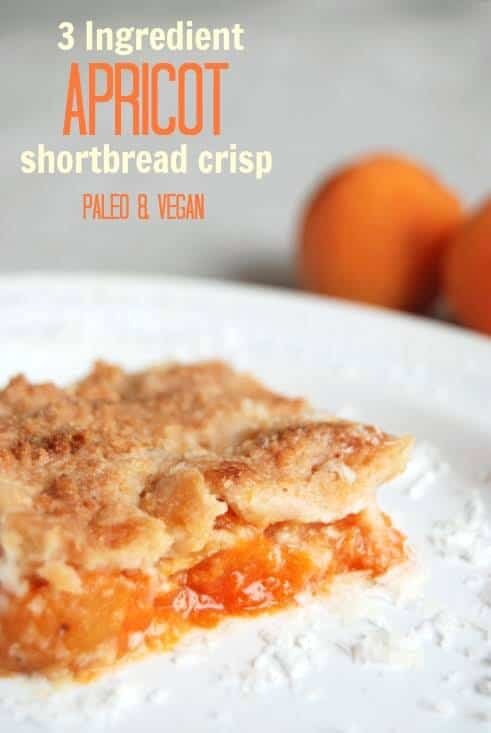 AIP: For AIP, use organic tiger nut flour instead of the almond flour. Cream of Mushroom Soup: If you would prefer to buy Cream of Mushroom soup, here is a healthy option, but it might not meet your dietary needs. Finely-Ground Nuts: You can substitute finely-ground soaked nuts for the almond flour. Homemade Garlic Powder: My Homemade Garlic Powder is a good option if you would like to make your own garlic powder. Palm Shortening: You can use palm shortening instead of butter for a dairy-free option. Vegan: Use coconut oil in place of butter and vegetable broth for the Chicken Broth in the Cream of Mushroom Soup. 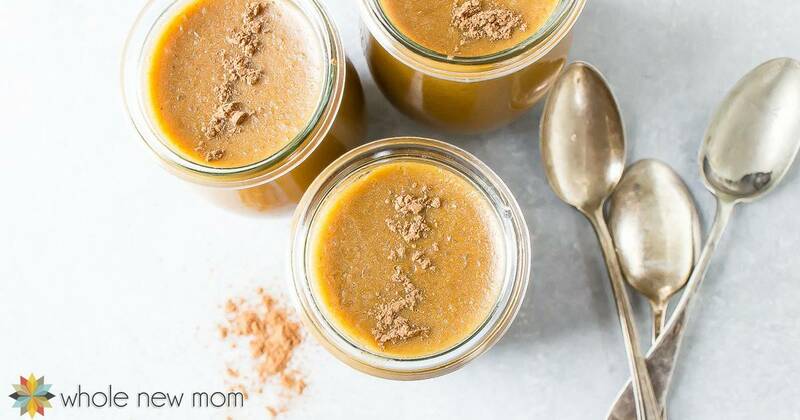 This Broth PowderBroth Powder is a great option for this purpose. This Healthy Green Bean Casserole is sooo much better for you than the traditional dish and is adaptable to almost any special diet--paleo, low carb, keto, vegan, THM, and even AIP! Preheat oven to 350°. In a large bowl, combine butter, almond flour, and ½ tsp salt and stir. 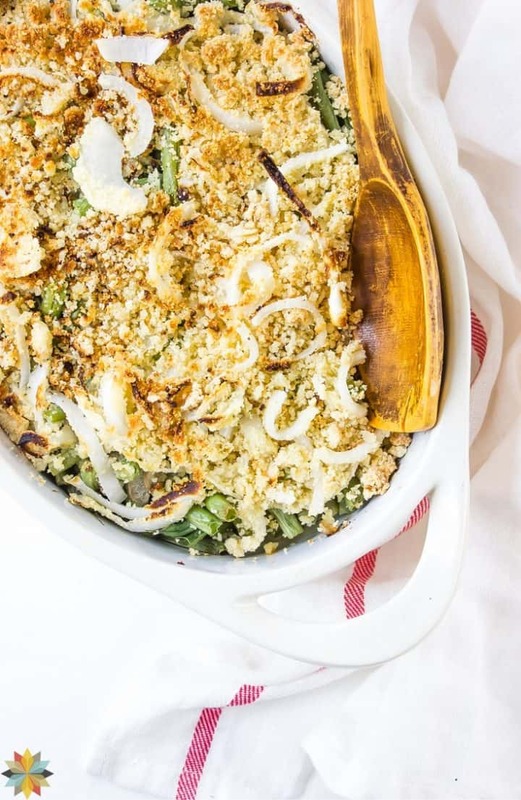 This fabulous vegan green bean casserole recipe is just one of the many allergy-friendly recipes in Nourishing Holiday by my friend (and I'm not just saying that she is my friend–she really is), Jaclyn Harwell. 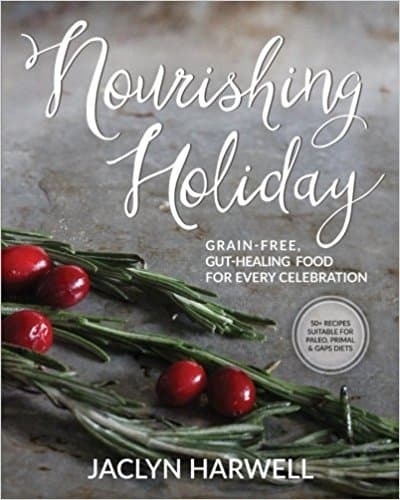 I'm telling you, if you are looking for special-diet friendly recipes that can get you through the Holidays in an enjoyable and celebratory fashion, you want this book. The above links are for the ebook version. For those of you who really want a print book instead, you can shop here. Now, I know that many of you have food allergies, and this book does have some dairy in it as well as eggs. We are too, mostly due to our son's life-threatening food allergies that caused severe eczema when he was an infant.. 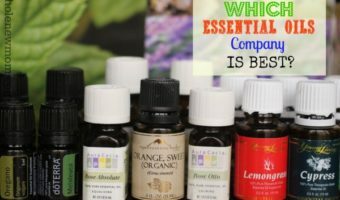 I think you'll have no trouble making the substitutions that you need. Just use store bought dairy alternatives, or make my Homemade Coconut Milk, Homemade Almond Milk, or Homemade Rice Milk. And I have to say that those are the EASIEST versions you will find anywhere. About 14 of the recipes will be tough to find substitutes for, since they are coconut flour recipes and those are notoriously hard to use an egg substitute with. You could try this Powdered Egg Substitute if you like for the best alternative, but coconut flour tends to work best with real eggs. If you can eat seeds, then using sunflower seeds might work well for you. Organic Tiger Nuts and organic tiger nut flour are also a great option! 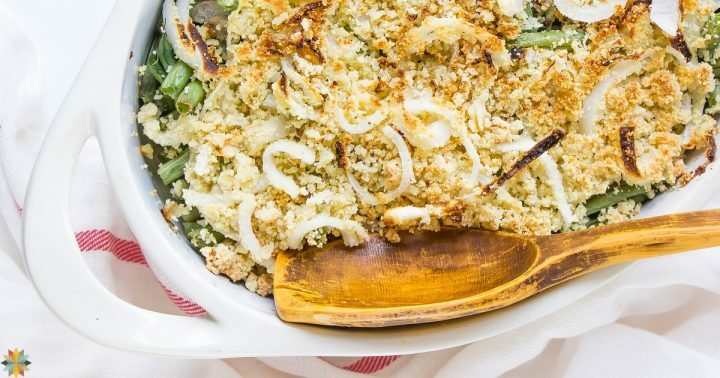 Will you add this Gluten-free Green Bean Casserole to your holiday table? Every holiday with my in-laws always included green bean casserole, so I was pretty sure this recipe would not please my picky husband. It did! He raved about how delicious it was-three times! The leftovers today were just as good and again he said how much he liked it, even more than the “regular” green bean casserole. A real winner for sure. But it does not serve 6-8 in our house. My husband and I ate 3/4ths of it right out of the oven. Yummy!! So great!! I am soooo glad you liked it! Happy New Year!